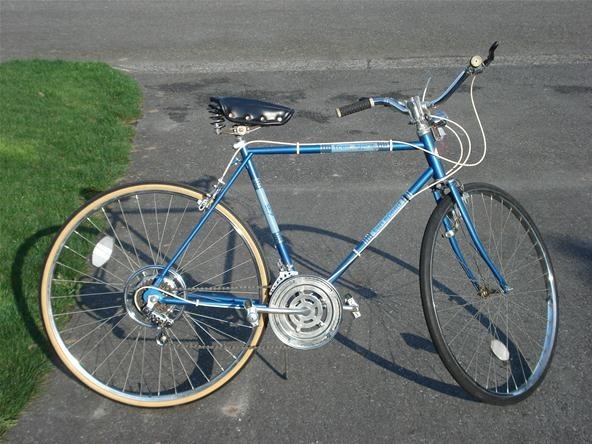 Unlike modern cars, bicycles have both a tube and a tire. The tube is filled with air and acts as suspension to make riding more comfortable. The tire protects the tube from being pierced and creates traction with the ground. A tube needs to be replaced or patched when it no longer holds air. 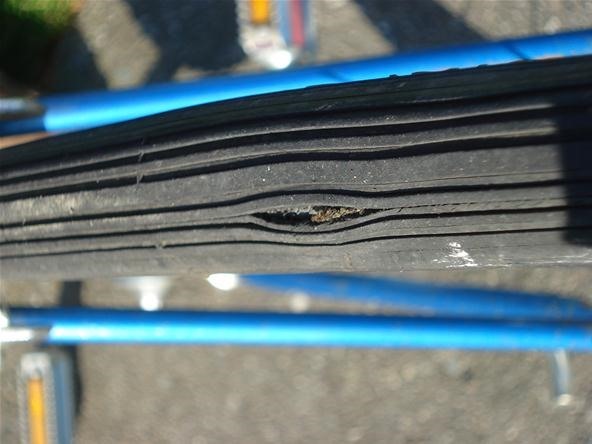 A bicycle tire needs to be replaced if it is cracked, worn out, or split. Inspect the outside of the tire to see if one of the problems mentioned above can be seen before the tire is removed from the rim. Look for an external problem. Look for anything that could have gotten through the tire and pierced the tube. If you can't see anything, run your fingers over the tire to feel for anything small and sharp. The picture below shows an old tire that has split. Flip your bike upside down or put it on a bike stand, if you have one. 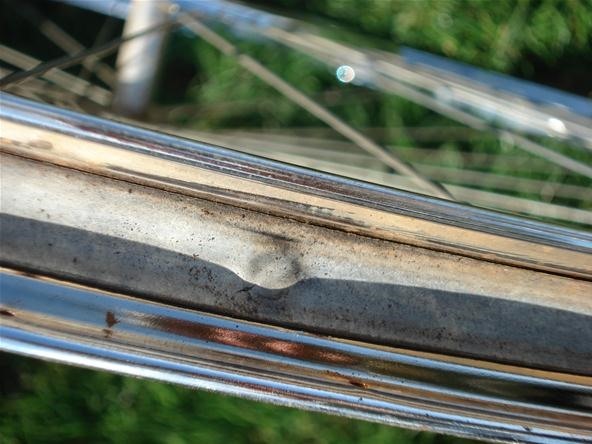 Depending on the age of your bike, you will either have to undo the bolts on either side of the wheel axle, or there will be a lever to release the axle from the frame of the bike. Be sure to open the brakes before you remove the wheel. Now that the wheel is separated from the frame of the bike, removed the tire and the tube. To do this, use tire levers. If you don't have a tire lever, a butter knife or screwdriver will work fine. Insert the tire lever between the wheel rim and the rubber of the tire. 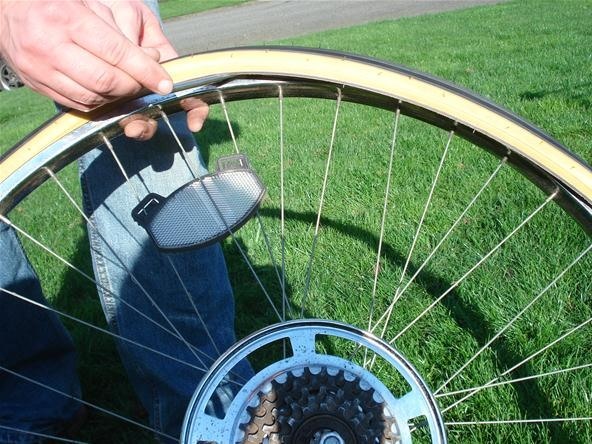 Use the lever to lift the rubber of the tire to the outside of the metal rim. Leave the tire lever in place to maintain that gap so that you can fit a second lever beside the first. Work your way around the circumference of the tire, lifting the edge of the rubber tire, one lever at a time. Below, the first tire lever has been inserted. And here's the second tire lever inserted next to the first. Repeat this the entire way around. 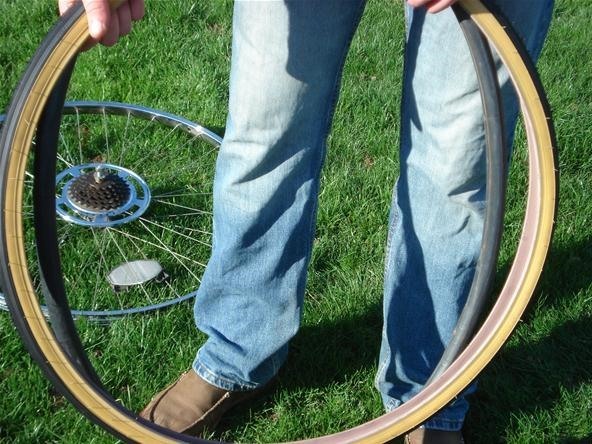 Once the tire and tube have been removed from the wheel, run your fingers along the inside of the tire and the outside of the tube to feel for any other sharp objects. 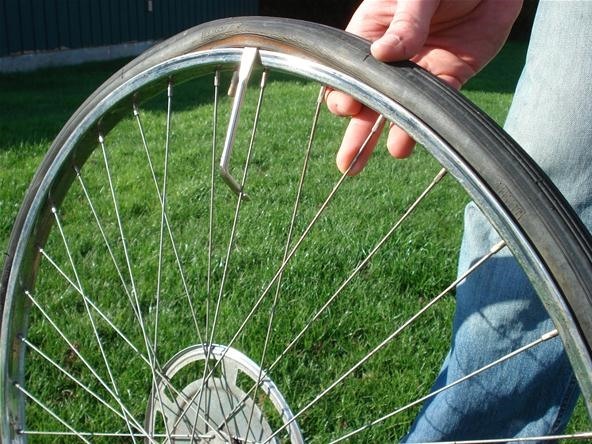 Also make sure that the rim of the tire has no sharp points that could puncture the tube. 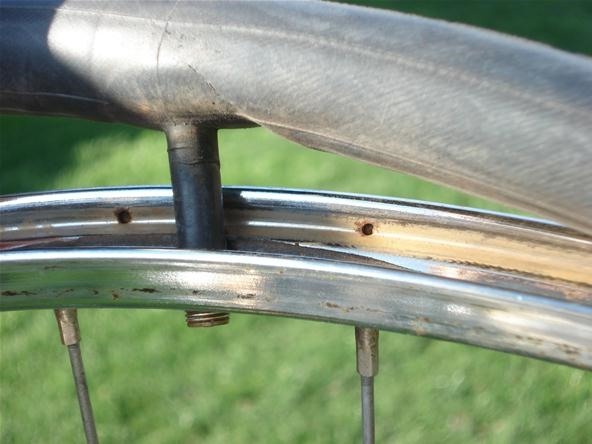 In the photo below, the rubber tape between the two rims of the wheel protects the tube from the spokes inside the wheel. If your tube has lost air, you may need to search for a hole. First, look for the hole. Second, apply pressure to the tube and listen for any sounds of escaping air. Third, you can immerse the tube in water and look for any released air bubbles. If you discovered a hole in the previous step, you will either need to replace the tube or patch the tube. If the hole is only a few millimeters in diameter, you can purchase a patch kit from any bike store and follow the instructions on the kit. A larger tear will require the tube to be replaced. You'll need to find out your tire size in order to buy a replacement tube and tire. Above, you'll see the tire size is printed on the side of the tire. This tire is size 27" x 1¼". 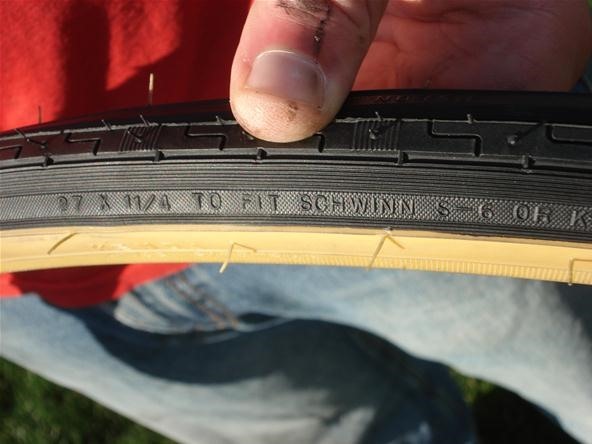 Insert the patched or new tube into the new tire. Line up the valve on the tube with the hole in the metal rim of the wheel. 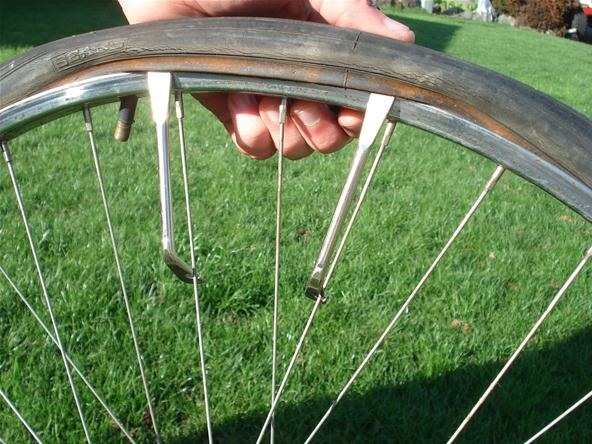 Use your tire levers to wedge the tire between the edges of the wheel rim. This is the reverse of what you did in Step 3 to remove the tube and tire. 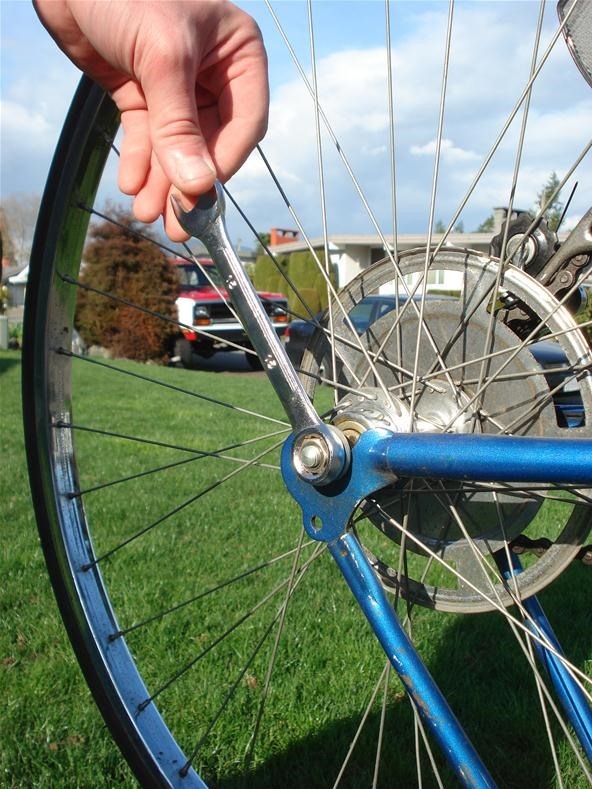 Put the wheel back on the bike and tighten the bolts or levers (whatever you loosened to remove the wheel in Step 2). Tighten your brakes. Spin the wheel to make sure it isn't touching either the brakes or the frame of the bike. Adjust accordingly. 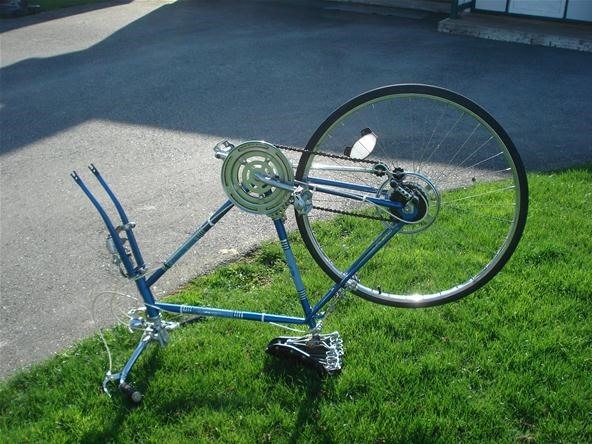 You will need to use a bicycle pump to inflate your tire. You are now ready to ride your bike! Great info! I usually just pry the tire off with my hands instead of using a tool. I usually find it pretty easy to do that.